When packing for a camping trip, it’s all too easy to get carried away and load everything but the kitchen sink into the SUV. And that’s understandable. After all, you have to bring your own lodging facilities and food and drink for the duration of your stay, not to mention clothing and other supplies. So how do you bring it back to basics, and still make sure you have everything you need? Here’s a list of the essentials that you can refer to when you start packing for your next excursion. Invest in a sturdy, three-season model from a reputable company, like L.L. Bean or REI. Resist the urge to buy a bigger one than you need. While you might be tempted by the extra space, you won’t notice it when you’re asleep, but you sure will notice the excess weight when you’re lugging the kit around. 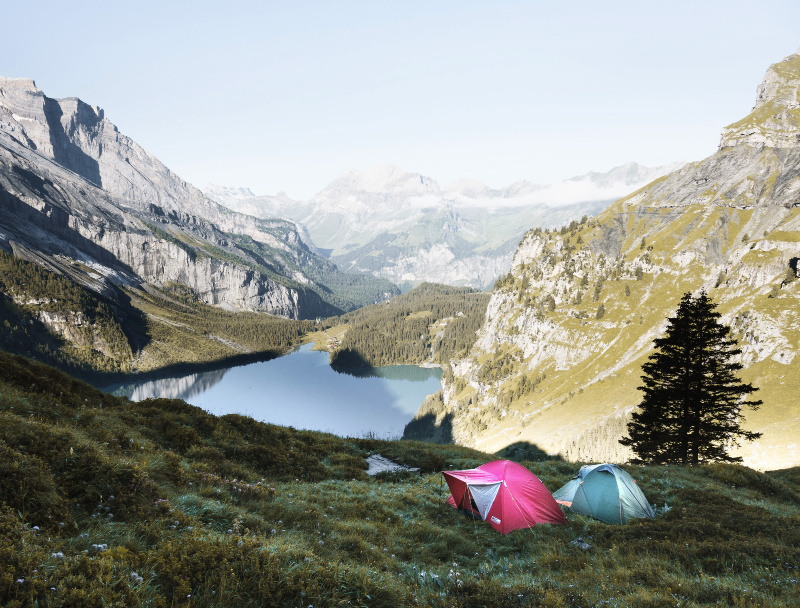 If you camp in all kinds of weather, it might be a good idea to invest in additional protection from the elements. These caravan awning roof rafters can be attached right to your vehicle, and are easily removed afterward. Again, buy the highest-quality bag you can afford, and make sure to follow proper protocol to ensure that it doesn’t get damaged. For example, never bring an open flame inside the tent, and don’t let your ten-year-old use a camping bag for a slumber party. Some purists view this as a luxury item, but you’ll be grateful for it. They’re lightweight, affordable, and take up very little room when rolled tightly. Flashlights are an obvious necessity. Headlamps can also be a great investment, especially if you often camp in the spring or fall, when it gets dark earlier. Make sure to bring along plenty of extra batteries as well. Your phone’s GPS will only get you so far, especially if you lose your signal or the battery goes dead. A compass, meanwhile, will always point you in the right direction. A camping first-aid kit should include Band-Aids, antiseptic, gauze pads, hydrocortisone cream, and a small supply of painkillers (such as aspirin or ibuprofen). Tuck in a foil blanket, a pair of tweezers, and a jackknife, and you’re good to go. What’s a camping trip without a campfire? Even if you don’t use it for cooking (though we highly recommend doing so, as this will cut down on your overall packing list), you should always have the means to start a cheerful wood blaze without resorting to the flint-and-spark method. There’s no need to get fancy here—a cast-iron Dutch oven and wooden spoon can go a long way toward heating and dishing up a batch of stew that you prepared in advance. If you go the paper plate route, you’ll also cut down on cleanup duties. A hat and a pair of UV-resistant sunglasses are essential for day wear. Pack thermal underwear and other lightweight warm layers for the evenings, and put them on before you need them to retain as much body heat as possible. Don’t forget to pack a water-resistant shell, especially if you’ll be boating. While you can certainly make your own additions, the list above will serve as a good starting point.